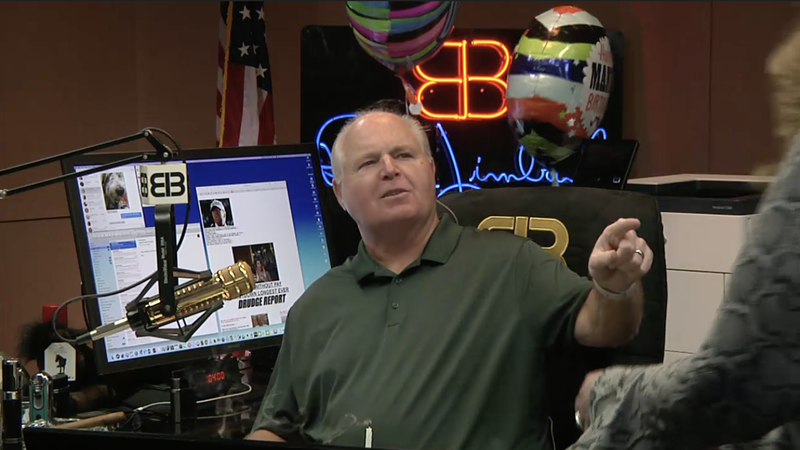 RUSH: I’m still looking at myself here on the Dittocam. You know, I left here yesterday doing that. I don't see myself on the Dittocam much. I mean, it's right there, but I don't stare at it much and I did yesterday and I'm still staring at it. You know, it's amazing how much better we guys get as we age. What I'm doing here is killing time because I knew this was gonna happen. The staff has walked in -- wait. The theme is still playing. They can't hear you singing so you've gotta start all over again. It's not my birthday today. Tomorrow is. In utter defiance of my wish that nothing be done about it, the staff every year comes in and sings happy birthday. (staff sings happy birthday) Thank you. What is that? What is that supposed to be? DAWN: It is a white trash cake, but it has glass balloons. RUSH: By the way, white trash cake is a popular term here that we use. It does not denote racial connotations at all. What are those, black olives on there? “A manly birthday.” Okay, just one candle, who can't blow that out? Gone. Oops! Forgot to make a wish. But the wish is always there. I like the colors on there. Thank you very much. I have given up, I've given up asking the staff to ignore this, they simply won't. I thought maybe I'd skate because the birthday is not 'til tomorrow. Do you know who else has a birthday on January 12th? Jeff Bezos. Did you know that? I had no idea. There's a lot of famous people with birthdays on January 12th. Of course with me leading the pack.